Michael Kors' Sofie Smartwatch combines the best of modern glamour and cutting edge technology. The slim, luxurious rose gold-toned bracelet and a fully round-shaped case create a more elegant, slimmer look with the bezel beautifully lined with luxe crystal accents. The touch-screen dial can be customised with a simple swipe to the left or right to give it your own unique style with plenty more faces available from the Play Store. Paired with your iPhone (iOS 9.0+) or Android (4.3+) smartphone, you can receive notifications for email, text and benefit from built-in fitness tracking. Voice activation from Google Assistant allows you to organise your day without ever having to take out your smartphone. The bracelet can be detached via its push-release mechanism and replaced with other customised straps. Upgrading your style and organising your day has never been easier. Michael Kors is a leading New York fashion designer blending together luxury fashion pieces with next-generation technology. 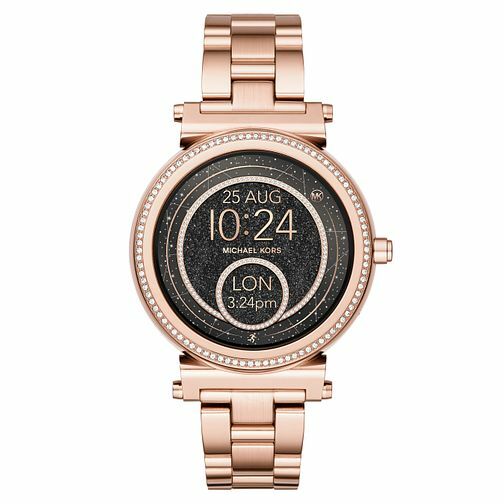 Michael Kors Access Sofie Gen 3 Rose Gold Tone Smartwatch is rated 4.4 out of 5 by 13. Rated 5 out of 5 by Anonymous from Amazing Great watch, wish you could reply to messages on it with an iPhone though!